Luigi Mancardi presented data to support HSCT. The ratesof efficacy are very good with NEDA rates of over 70% at 5 years after treatment. Dr Cohen accepted these results as being impressive, but suggested that they may restricted to highly active patients. However, J.A, Cohen argued that these studies were variable, uncontrolled, small and one has to balance this with toxicity and potential adverse effects of conditioning and secondary later stage effects. 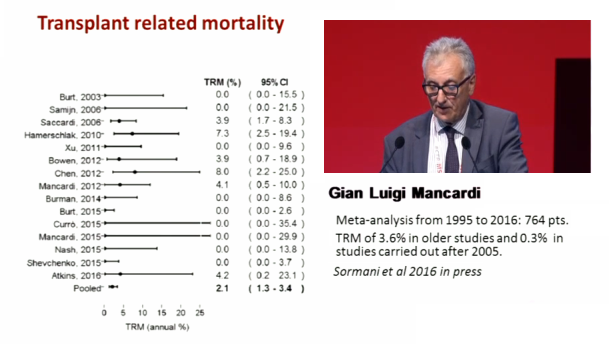 Mancardi argued that mortalitiy has been falling based on publications. It was high (7-8%) in it’s beginnings but has been reducing since 2005 and much lower (none) since 2011. A paper will be published that indicates that people with less disability, not progressive MS, are less likely to have mortality. People with active relapsing disease were the preferred recipients (had failed treatments); less than 45 years of age and a duration no longer than 10 years and less than EDSS 6 are onset of treatment. Background: Multiple sclerosis (MS) is an inflammatory disease caused by autoimmune reactivity of T-cells towards brain myelin. Intense immunosuppression followed by autologous haematopoietic stem cell transplantation (AHSCT) has been proposed in last years as a treatment option for patients with no response for I- and II- line therapy. A majority of long-term follow-up observations after AHSCT confirmed a great potential and efficacy even for aggressive MS forms which is due to induction of reset of the immune system and elimination of aberrant auto-reactive T-limphocytes. Objectives: The aim of this study was to evaluate the safety and efficacy of low-intensity immunosuppression followed by an AHSCT for patients with aggressive MS.
Methods: 89 patients with active relapsing-remitting MS (RRMS) and active secondary progressive MS (SPMS) were involved to the study. The qualification criteria were according to the guidelines of the European Group for Blood and Marrow Transplantation (EBMT) 2012. The group consisted of 78 patients with RRMS and 11 patients with SPMS. The stem cells were mobilized with cyclophsosphamide (Cy) and granulocyte-colony stimulating factor (G-CSF). After conditioning with high-dose chemotherapy, the stem cells were re-infused into the patient. The primary endpoint was to assess “No evidence of disease activity” (NEDA) defined as absence of relapses (Relapse free survival – RFS), absence of confirmed disability worsening (Progression Free Survival – PFS), and absence of radiological activity, detected by magnetic resonance (MRI-EFS). Results: There were 49 female and 40 male in the follow-up group. The mean age was 38 year. The median EDSSA before AHSCT was 5,0 and it decreased to 4,25 after 3 year follow-up of the treatment. The 3 years NEDA was observed in 74% of patients. No mortality was observed. Short term side effects were limited to symptoms due to AHSCT procedures. No long term side effects have been observed so far. Conclusions: AHSCT should be considered as an option for highly active MS treatment but only if performed according to very restrictive qualification criteria and performed in highly specialized haematological centress. "people with less disability are less likely to show less chance of mortality". So someone with more disability is more likely to show less chance of mortality? I got a bit tangled in the lesses. Thanks for clarifying. So when will it be deemed to be a cost-effective and efficient alternative to DMTs? If it does stabilize / improve EDSS in the long-term does that not help to outweigh the mortality risk in terms of societal benefit? I think it would be naive to assume that is not a considerations for NHS and others. But also on an individual basis, individuals have to weigh up the pros and cons of a particular treatment – i.e. high risk but effective, verses low risk but less effective.